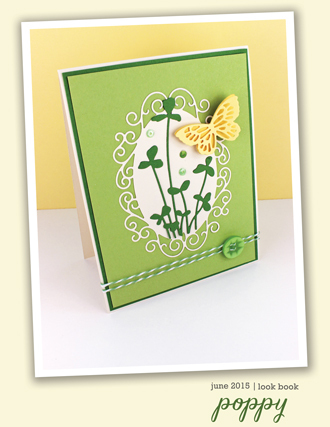 The Splendid Rose Frame and butterflies from the Butterfly Meadow create a versatile card in soft spring colors. 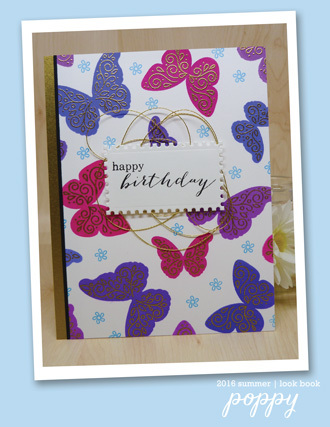 Add a simple greeting from the Poppystamps Birthday Blowout Clear Stamp Set - and you're ready for any occasion. 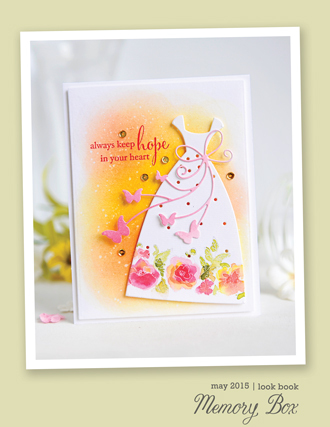 Hi, Jean Okimoto here with an updated, glittery version of my March Challenge inspiration card. But first - thank you for all of your wonderful comments during our Spring Blog Blitz and congrats to all of the winners. Enjoy your prizes! 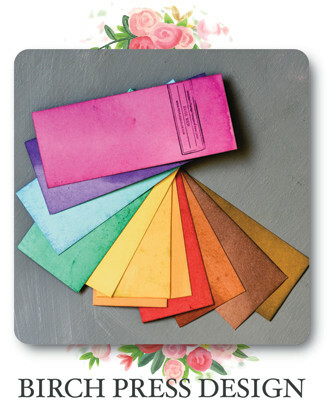 Create a dreamy background for these great new dies with a Pastel Kaleidacolor inkpad. Spritz a 5" square of watercolor paper lightly with water. 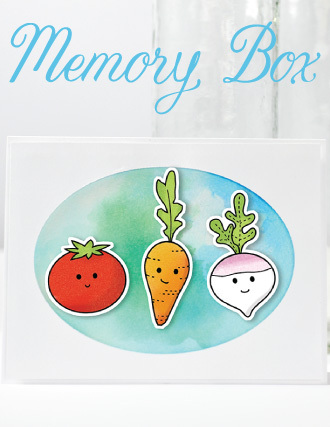 Press the inkpad (keep the colors separated) onto a large acrylic stamp block. Spritz the inks and let them blend for a few seconds. Press the inks firmly onto the damp watercolor paper. Lift and rotate the block to transfer the residual inks to other sections of the paper. Lightly spritz the paper, then airdry it for a few minutes. Heat-set it from both sides to minimize curling. 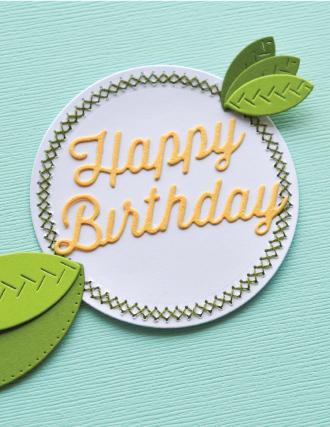 Cut it with the 3-¼" Circle Basics die - save a section for the greeting. Cut the inner frame and rose section of the Splendid Rose Frame from dark gray cardstock. 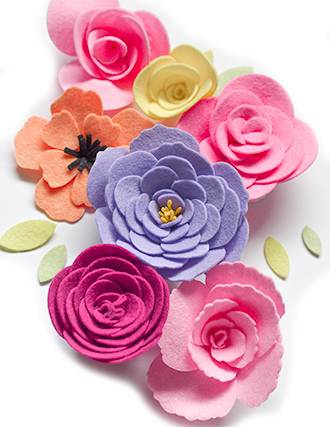 Cut the solid rose from pink cardstock. 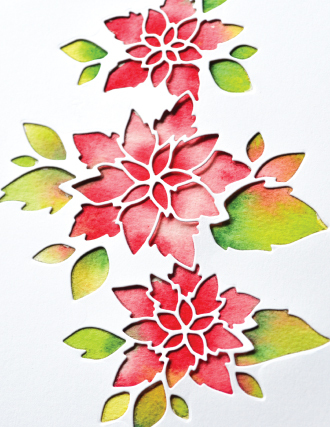 Pressure-emboss it with the detailed rose using the embossing mat and plates required for your machine. 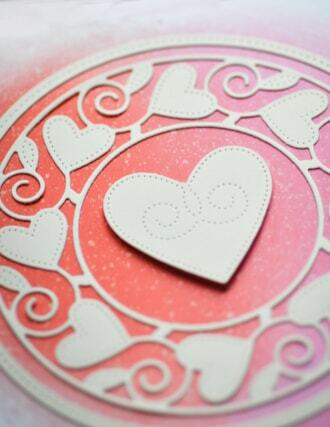 The embossing adds extra dimension to the pink diecut. Stamp the greeting - from the Poppystamps Birthday Blowout Clear Stamp Set - on a scrap of the watercolored paper with Espresso Truffle Memento Luxe. Love that contemporary typestyle! Heat-set it. 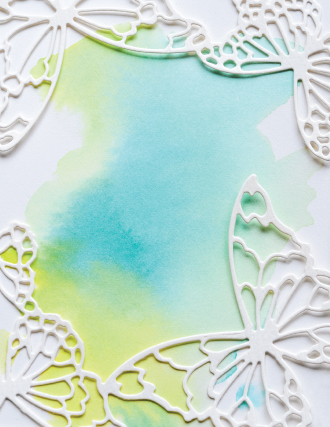 Cut the butterflies from the Butterfly Meadow set from turquoise glittered cardstock. 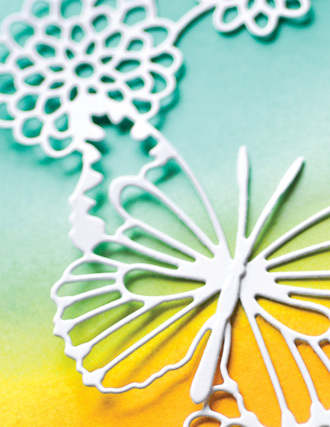 Cut extra butterflies from gray cardstock and layer them for dimension. 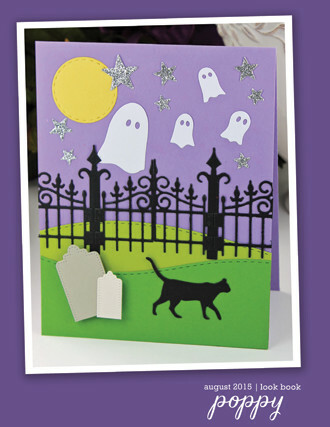 Attach everything to a side-folded A-2 card of textured gray cardstock - use foam dots for the greeting. Add clear gem stickers. 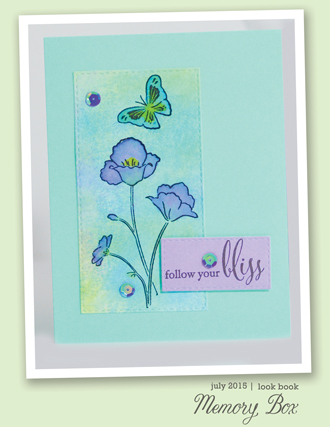 We'll be using several of the great Spring Collection stamps and dies in classes at Impress on Sunday March 10th. 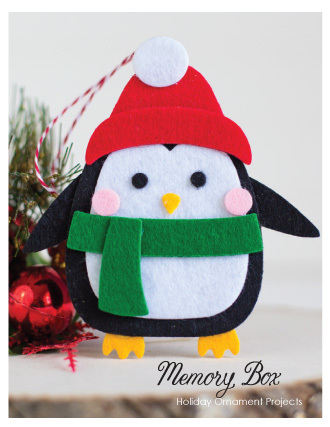 We'll mix and match the just-released designs with classic favorites from my stash. It's FRIENDS + FLOWERS at 11:30 - followed by SIMPLY ASIAN at 2:30. 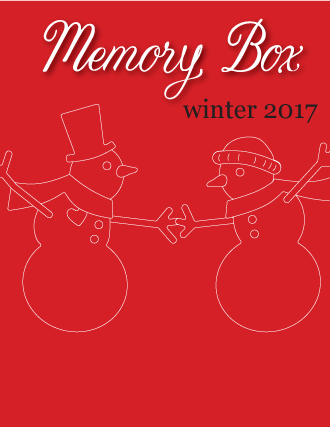 Cool techniques, some origami - and a lot of Memory Box, Poppystamps and Birch Press! Join us if you're in the Seattle area - call Impress (206 901.9101) to reserve your seat. 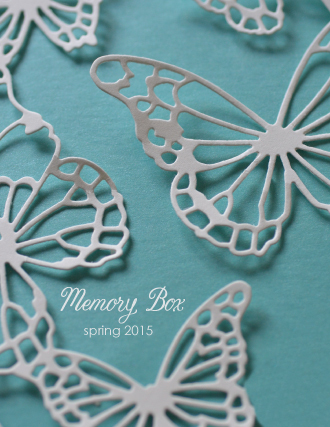 Welcome to our Spring Collection Blog Blitz! 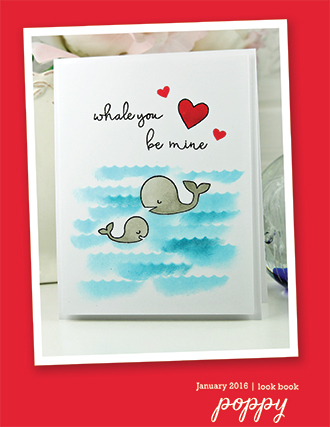 Watercolors are the backdrop for the new Happy Octopus, Underwater Scene fishes and Oceanside Typewriter Sentiments on today's card. Hello, Jean Okimoto here with a nautical design - and a few techniques. I'm hoping it looks like the octopus is emerging from the water and greeting the fishes. Create a quick ombre look with Blue Breeze Kaleidacolor. Follow the instrucions on the container to move the individual inkpads together for brayering, but separated for storage. Spritz the smoother side of watercolor with water. Ink a 4" soft rubber brayer by rolling it repeatedly (about 25 times) over the inks. Cover the entire inkpad by rolling it in one direction instead of back and forth. Hold the inked brayer horizontally (to prevent drips) and spritz it with water - two spritzes are better than one. Roll the inks onto the damp watercolor paper. Air-dry it for a few minutes. Spritz it lightly with water, wait a few seconds, then heat-set both sides to minimize curling. Cut it with the waves and frame section of the Happy Octopus set - run it through your machine with the waves running horizontally instead of vertically. Cut the fishes from a Post-It - use the offcut to select the area you want to cut. Place the die back into the cutout and cut the fishes, exactly where you want them! Cut the octopus head twice from watercolor paper. Attach a scrap of black cardstock behind the eyes of one head. Layer the second head behind it for dimension. Cut the tentacles. Attach the head and two tentacles behind the waves. Slip two tentacles between the wave slots and tape them behind the waves. Stamp the greeting from the Oceanside Typewriter Sentiments set on the smoother side of watercolor paper with Electric Purple Radiant Neon. Emboss it with detail clear powder. Cut it into a strip with the scalloped edge of the wave section. 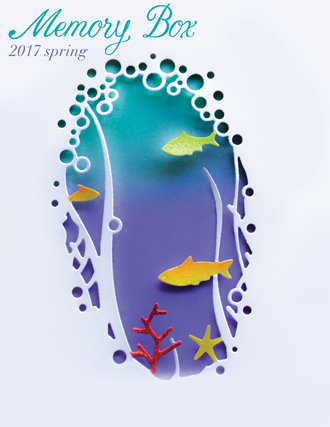 Attach the diecuts to a Violet Notecard - use foam dots for the fishes, greeting and octopus head. Color clear gem stickers with a Sharpie or Copic Marker that matches the greeting. The ink is much pinker that it appears on the inkpad. Want a chance to win the whimsical Happy Octopus die set? Add a comment on this post by Sunday, March 3rd at 11:59pm EST. One comment will be selected at random to win the set. There will be a chance to win one of the new release items each day this week through Sunday. Winners will be announced on the blog on Monday, March 4th at 6pm EST. Good luck! Big thanks to everyone from Sunday's GREETINGS FROM BIRCH PRESS class at Impress! 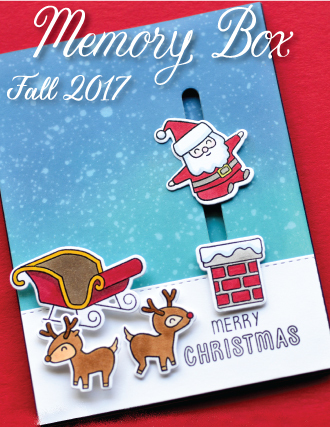 Hope you like the cards - and all of the techniques we used with those great dies and stamps. 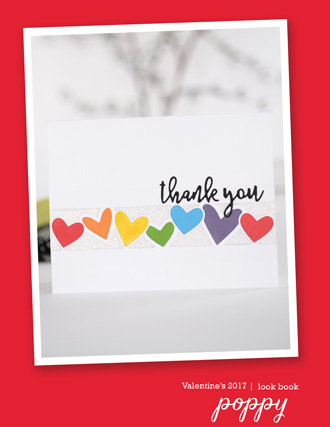 Thanks also to Ann, Erin and Lynne for your help in finding the supplies we needed for our cards. Be sure to comment on all of the Design Team's blitz posts. Hope you're a winner! Let's celebrate Valentine's Day by meeting the new Happy Octopus die set - and matching him up with some favorites from our Valentine's Collection. 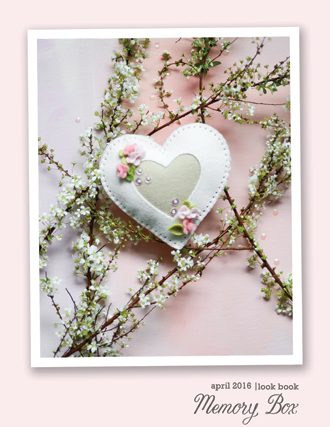 Hello, Jean Okimoto here with the first of many wonderful new dies from our Spring Collection. I think he's perfect for the transition from one great release to the next. Cut the main section of the octopus from gray cardstock and attach a scrap of black cardstock behind the eyes. Cut two more of the octopus from black cardstock and layer them for dimension. Cut two sets of tentacles from gray cardstock. Paint watercolor paper with turquoise and green dye inks. Airdry it, then spritz it with Imagine Crafts Gold Sheer Shimmer Spritz. Heat-set it. Cut it with the ring and waves. Cut another set from black cardstock. Attach the octopus and two tentacles to the waves. Slip the bottoms of the six tentacles in the foreground through the wave slots and tape the ends on the back. 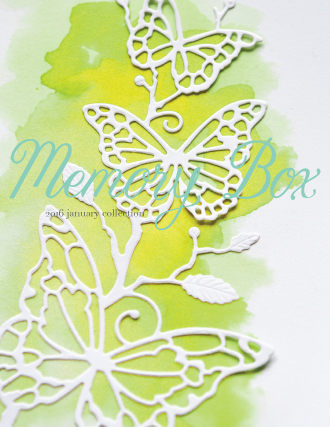 Layer the black diecuts behind the watercolored pieces to add dimension and highlight the details on both pieces. 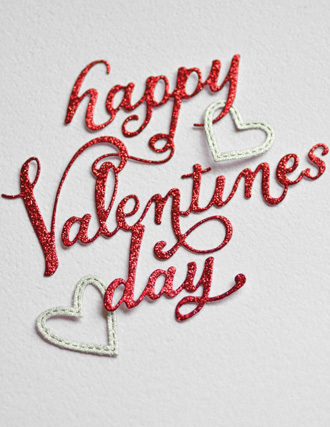 Cut four hearts of glittered red cardstock with Heart Board. Cutting Sending Jotted Script from gray and white cardstock. Leave the tiny dot over the "i" in the die until you're ready to attach it. Prep gray cardstock with anti-static powder. Stamps "hugs" - from the Best Life Typewriter Sentiments Clear Stamp Set - with VersaMark. Emboss it with detail white powder. 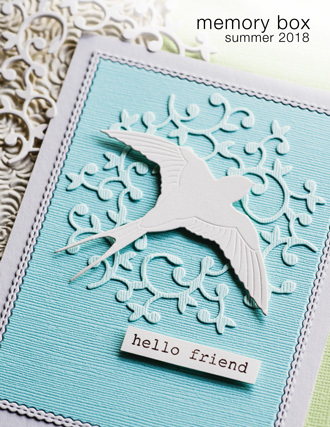 Attach the pieces to a top-folded white A-2 card. I think you'll love the new Spring Collection. It's filled with butterflies, flowers, Easter icons and nautical designs - and three must-have greetings stamp sets. We're looking forward to sharing our new designs and ideas with you! 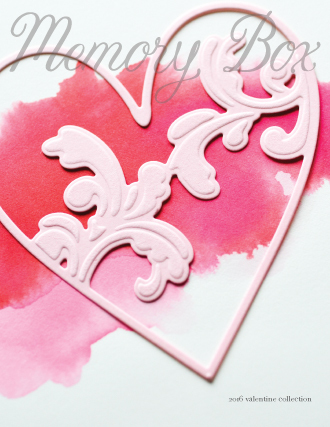 Watercolor a Pinpoint Rectangle Layer, add a light mist of gold spritz - then emboss it with Heart Board. Add a Cozy Mug, glittered hearts and a bit of love with the layered Love Jotted Script. Hi and happy weekend - Jean Okimoto here with a bright design to warm a cold winter day. Press the Berry Blaze Kaleidacolor inkpad onto a large acrylic block. Paint watercolor paper with random, diluted layers of the vibrant inks. Air-dry it, then spritz it with water. Spritz it again with a light mist of Imagine Crafts Gold Sheer Shimmer Spritz. Heat-set it - heat it from both sides to minimize curling. Cut it with the 3-⅛" x 2-⅛" Pinpoint Rectangle Layer. Pressure-emboss it with the new Heart Board - use the plates and mats recommended by your machine's manufacturer. Here's the sequence I used on my Platinum - platform, die face-up, watercolor paper face-down, tan rubber embossing mat, purple embossing plate. 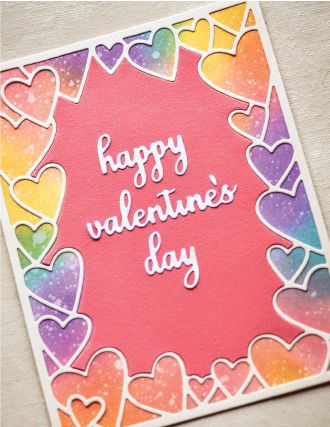 Cut pink glittered cardstock with a large heart from Bright Hearts and one each of the hearts from the Heart Board. Cut a Cozy Mug from printed paper. I used a bright contemporary leaf pattern from Shizen Design. 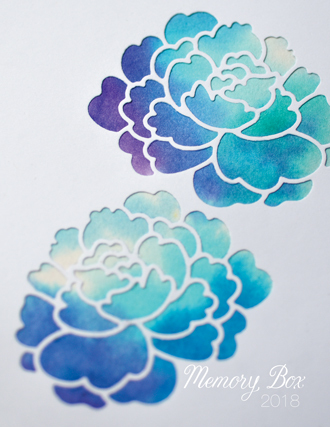 Cut Love Jotted Script from a double layer of white cardstock and a portion of a Peony Notecard. 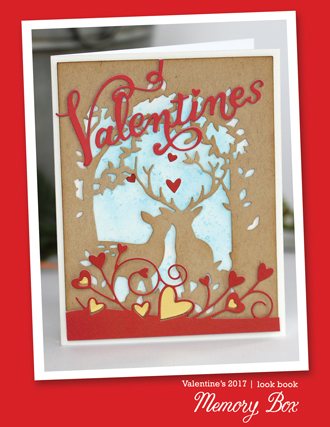 Attach the diecuts to a 5-¼" square white card - use slivers of foam tape for the handle. 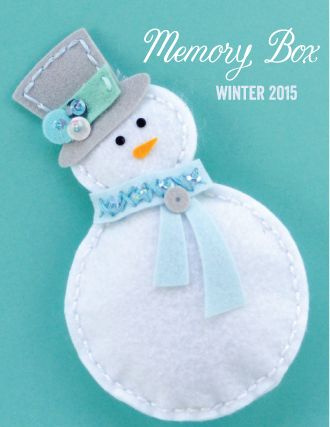 It's easy to overlook pressure-embossing with our stash of Memory Box dies. The dies - personally designed by Dave Brethauer and made in the USA - create beautiful textured backgrounds and accents. 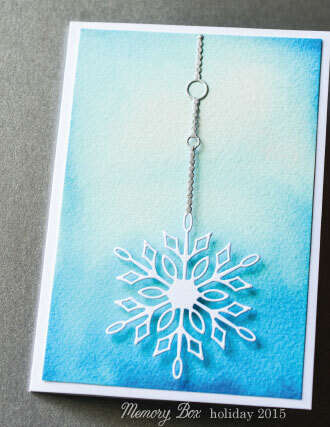 They're also great for simple cards - just emboss the front of the card, add a quick note and it's done! 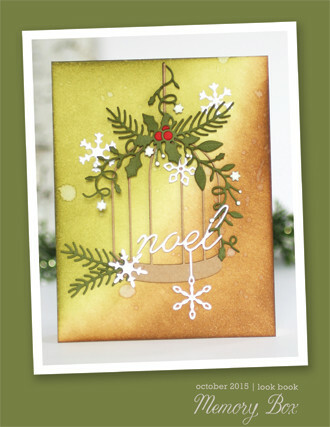 Watercolor a background for the Holly Collage and add a bright message from the Bold Christmas Greeting Clear Stamp Set. Add the look of washi tape with a stamped strip from the greeting set too! Hello, Jean Okimoto here with a quick card for your busy schedule. Create a palette of inks by pressing the Fresh Greens Kaleidacolor inkpad onto a large acrylic block. Paint a square of watercolor paper with random, overlapping shades of green. Let the inks mix and mingle for a few minutes - then heat-set them. 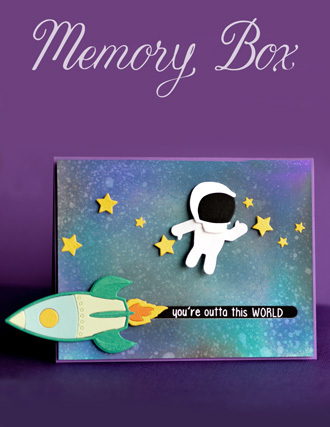 Cut white cardstock with the 3" x 4-¼" Rectangle Basics die. Cut it with the Leaf Collage. Cut a 2-¾" x 4" piece of the watercolored paper and attach it behind the collage. Stamp the striped strip with VersaFine Smokey Gray and quickly emboss it with detail clear powder. Trim it using the long edge of one of big Rectangle Basics dies. It'll have nice edges - and it's easier than cutting a skinny strip w/ a paper trimmer. 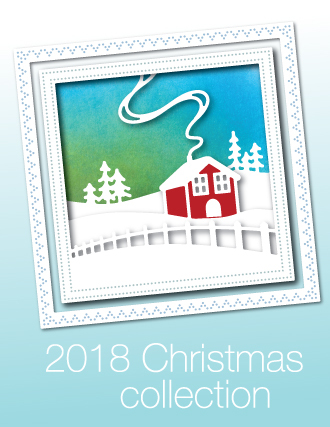 Stamp the greeting from the Bold Christmas Greetings Die Set with VersaFine Clair Charming Pink and quickly emboss it. 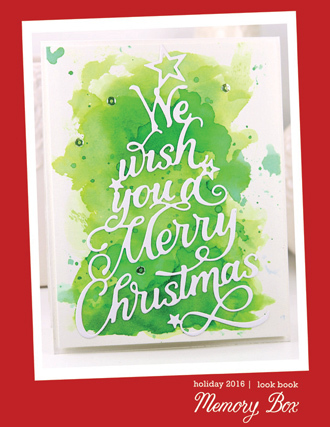 Cut the words with the coordinating dies from the Bold Christmas Greetings Clear Stamps. 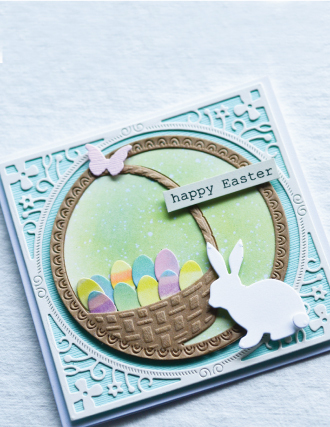 Cut an extra set of the greetings and layer it behind the stamped pieces for extra dimension. I keep many of my die sets on shower curtain hooks for easy access and organization. 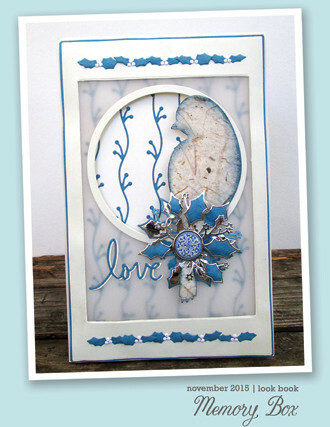 Attach the diecuts to an A-6 (4-½" x 6-¼") textured white card. Add dark pink gem stickers. 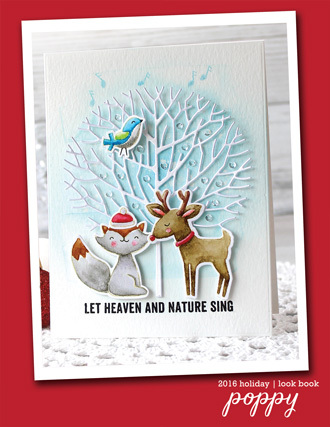 If you're in the Seattle and like the clean, simple look of Asian designs - join us for another SIMPLY ASIAN - HOLIDAY CARDS class at Impress on November 17th. 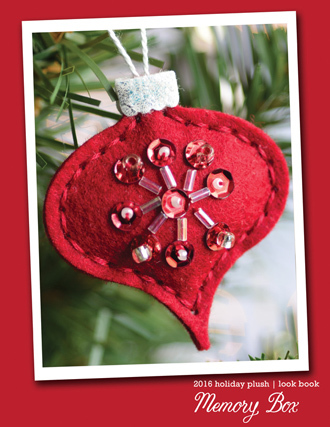 Make an easy origami starburst and tree for your cards - and use the latest Birch Press Design dies and stamps too. 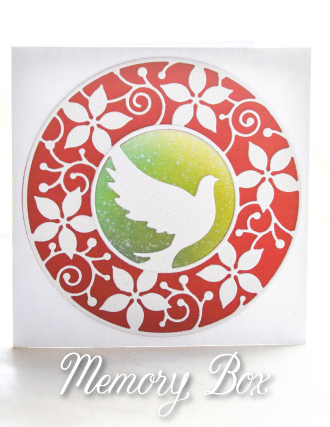 We're loving the new triangles and stamp patterns! Leaf Collage and Kaleidacolor create a fall backdrop for the new Thankful Jotted Script die set. It can be a Thanksgiving card - or a thank you card for a special gift or act of kindness. 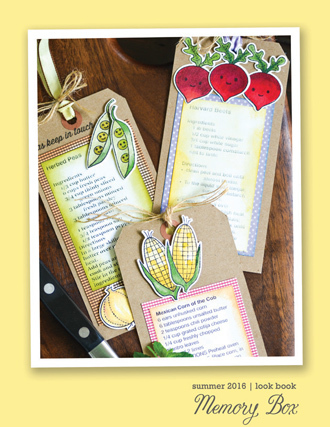 Hello, Jean Okimoto here with another November Challenge inspiration design. Press the inks from the Tomato Vine Kaleidacolor onto a large acrylic block - keep the colors separated as though the inkpad is in storage. Use a tissue to remove the strip of brown ink. Spray the inks with two or three light spritzes of water. Press watercolor paper onto the diluted inks, then rotate it 90 degrees to pick up more color. Set it aside to airdry. I like to use large pieces of watercolor paper so I can rotate it to find the perfect blend of colors for the collage. Splatter a few drops of water onto the dried watercolor paper. Let it set for a few seconds, then press it with a double layer of folded papertowel to blot some of the color for a speckled look. Dry it. Clean the acrylic block and press the inks onto it again. Use a damp paintbrush to splatter some of the Olive Green ink (between the brown and the yellow). 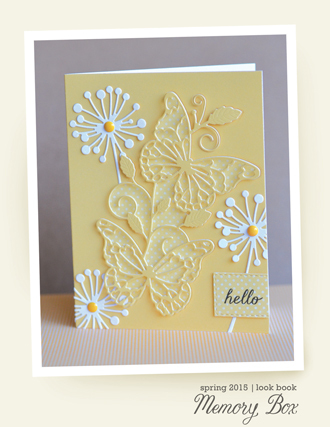 Cut white cardstock with the 3-½" x 4-¾" Wrapped Stitch Rectangle die. Cut the rectangle with Leaf Collage. Trim the watercolor paper slightly smaller than the rectangle. Diecut Thankful Jotted Script from white and bronze metallic cardstock. 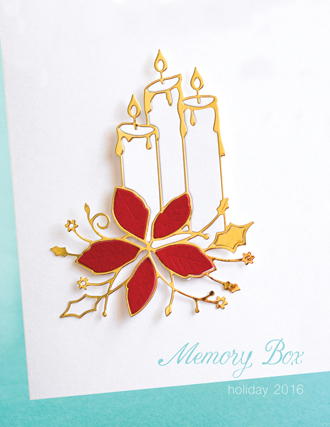 Attach the diecuts to a white 4-½" x 6-¼" card. Add ¼" circles of orange glittered cardstock. 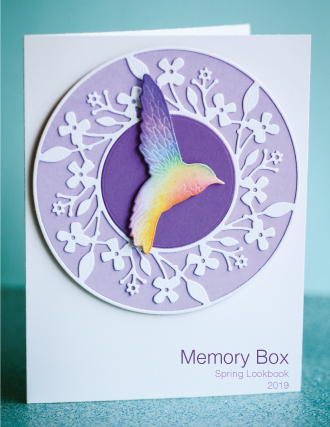 Memory Box dies and Kaleidacolors are the perfect combination. 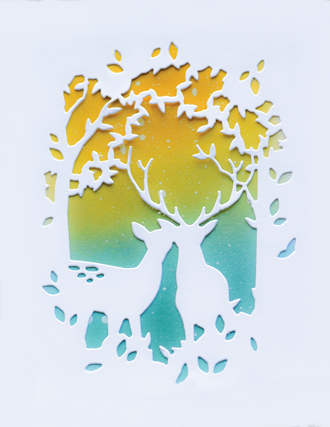 Create great backgrounds or blend colors to create paint custom-colored diecuts. Color extra pieces of watercolor paper and have them ready for future projects. Enjoy the long weekend if you have a holiday on Monday. 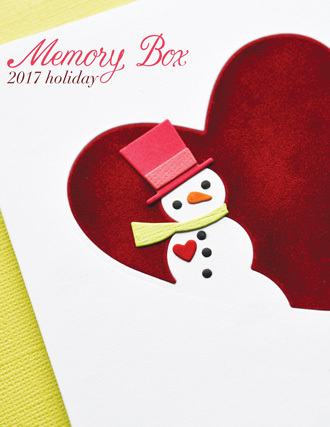 If you're in Seattle, join us for the MERRY AND QUICK holiday cards class at Impress on Veterans Day.